The Warkworth Modular Play Tower is a huge structure brimming with exciting features that will encourage children to climb, traverse, build dens and re-enact stories through role play. 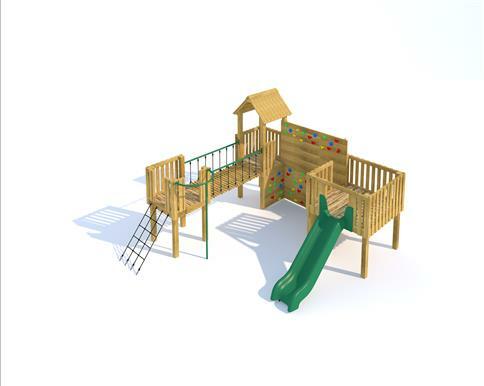 This tower design includes a huge Climbing Wall which connects two platforms providing the children with a challenging crossing which will build their upper body strength, hand strength and fine motor skills through grip and grasp. There are multiple entry and exit points which include a Climbing Net, Fireman's Pole, climbing wall and slide. Den-making can take place underneath due to the amount space available.